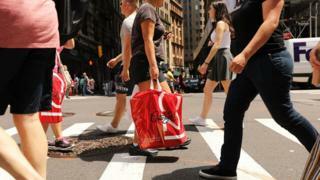 US economic growth slowed to an annualised rate of 2.6% in the final three months of 2018, figures show. However, the reading was ahead of expectations for a rate of between 1.8% and 2%. The pace of growth was below the 3.4% rate seen in the third quarter thanks to a slowdown in consumer spending. The growth figures had originally been due to be released in January, but were delayed because of the 35-day US government shutdown. The US economy was boosted last year by a big tax cut and an increase in government spending. Ian Shepherdson, chief economist at Pantheon Macroeconomics, said that the fourth quarter was "not a bad performance" given that the economic boost from the Trump administration's tax cuts is now fading. For the full year, GDP grew by 2.9% - just shy of President Donald Trump's 3% target - compared with 2.2% in 2017. Mr Shepherdson said he expected that growth in 2019 would revert to the "post-crash trend" of between 2% and 2.5%, "demonstrating that the personal tax cuts offered nothing more than a sugar high, and that the business tax cuts did nothing to lift trend growth. Though they did make shareholders richer". Capital Economics chief US economist Paul Ashworth said he expected growth of 2.2% this year and 1.2% in 2020. It has certainly been a significant slowdown. But that figure of 2.6% is still reasonably strong. It is actually more than most independent economists think the US can sustain over the long term. Many think there was a short-term boost from President Trump's tax cuts which is now fading. In the coming years, the economy will face further headwinds from an ageing population. The view that long-term prospects are rather more modest is shared by policymakers at the Federal Reserve. They consider the long-run growth of the US economy is likely to be somewhere between 1.7% a year and 2.2%. President Trump by contrast has suggested that 4% is doable, and his administration is aiming for 3%. Growth for the full year 2018 was very close to the latter figure. But sustaining it will be a serious challenge. Consumer spending, which accounts for more than two-thirds of US economic activity, increased at an annual rate of 2.8% in the final three months of last year. That was a slowdown from the 3.5% rate set in the previous quarter. Recent figures showed that retail sales fell by 1.2% in December while demand for new vehicles dropped by 1% in January compared to the same month last year, with car sales particularly hard hit with a 4% drop. Mr Ashworth said that both factors mean that "consumption growth could fall below 2%" in the first quarter of 2019. Also, while business investment growth reached 6.2%, he said "the first quarter won't be this good". "We already know that lower oil prices will depress mining investment, while the weakness of underlying durable goods orders points to a softer equipment showing."